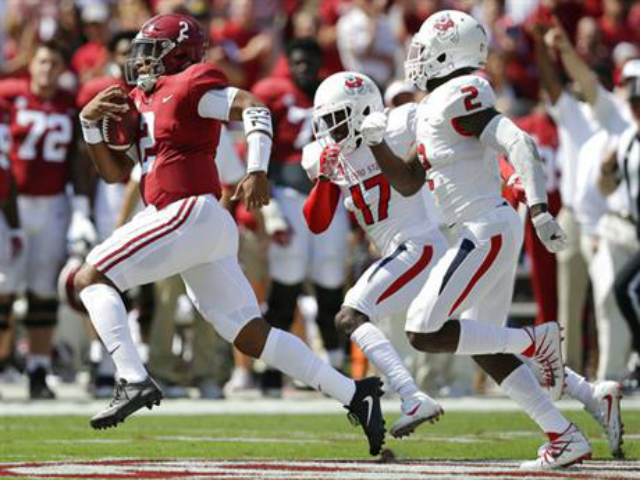 Jalen Hurts set the tone for Alabama early in the week and again to start the game. The top-ranked Crimson Tide needed to play better Saturday against Fresno State, he told his teammates. Hurts certainly did. He ran for 154 yards and two touchdowns and passed for a third score in No. 1 Alabama’s 41-10 victory Saturday, getting the Tide rolling with a 55-yard touchdown run two plays into the game. Alabama (2-0) polished off the 44-point underdog Bulldogs (1-1) with a workmanlike performance on the heels of a hard-hitting opening victory over No. 10 Florida State in Atlanta. Hurts completed 14 of 18 passes for 128 yards, but his biggest play came in the opening minute. He kept on a zone read and sprinted for a touchdown, stepping out of a last-gasp tackle attempt at the 15. Hurts also hit a wide-open Hentges for a 23-yarder in the first quarter. It was the tight end’s first career touchdown. “I thought we did a good job of executing the game plan, came out and played hard and did a way better job of executing,” Hurts said. The Tide led 28-3 at halftime against Fresno State, which opened coach Jeff Tedford’s first season with a 66-0 win over FCS Incarnate Word. Alabama outgained the Bulldogs 305-58 on the ground. Fresno State: Managed to move at times against Alabama’s defense, but couldn’t reach the end zone until late. Virgil had a solid day, completing 21 of 34 passes for 180 yards with an interception. Held Alabama to two short field goals in the second half, including once after the Tide started inside the 5 after an interception. Alabama: Won its 16th consecutive home opener. Coach Nick Saban stretched his personal streak in that category to 17. There was nothing especially dazzling about the performance except for Hurts’ running. Top tailbacks Bo Scarbrough and Damien Harris had only six carries apiece. The game gave Alabama a chance to get significant playing for freshman quarterback Tua Tagovailoa and fellow five-star signee tailback Najee Harris. Tagovailoa was 6 of 9 for 64 yards in his college debut with a 16-yard TD pass to another highly touted freshman, Henry Ruggs III. Najee Harris ran for 70 yards on 13 carries. Alabama had four of its top linebackers on the sidelines with injuries, with Christian Miller and Terrell Lewis out for the season. Former walk-on Jamey Mosley, younger brother of Baltimore Ravens linebacker C.J. Mosley, and Keith Holcombe made their first career starts. “We obviously have a lot of work to do at that position,” Saban said, adding that the game experience will help in that regard. Alabama faces another Mountain West Conference opponent when Colorado State visits. Fresno State plays a second straight 2016 playoff team, visiting Washington for the first time since 2006.